Thailand is a synonym of wellness, and at Novotel Samui Resort Chaweng Beach Kandaburi we know that well. Stay fit and get pampered during your stay with us, with our fitness and spa facilities. 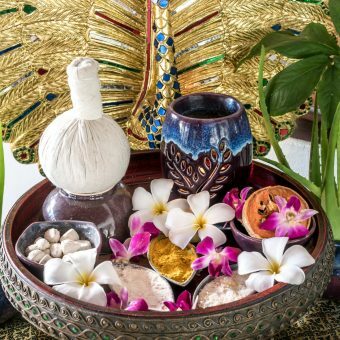 Come and discover the captivating magic of Asia, de-stress and awaken your senses by visiting Kanda Spa on arrival to Koh Samui, or during your holidays on the island. – For body oil massage, we use traditional Thai aromatherapy oils. You can choose between our range of ylang ylang, orchid and kaffir lime essential oils, which are mixed with coconut oil, or just pick plain coconut oil for your treatment. Massage by the beach or by the pool: 11 a.m. to 6 p.m.
Kanda Spa is open to both in-house guests and outside customers. To make a booking fill in the form on this page, or call +66 77 428 888. Opening hours: from 6:00 am until 9:00 pm. Comprehensive indoor fitness center with the latest equipment offers you the best way to stay in shape while away from home.